President Tsai Ing-wen received a European Parliament friendship group delegation Feb. 20 at the Office of the President in Taipei City, vowing to further strengthen Taiwan-EU relations via expanded cooperation and exchanges. The EP-Taiwan Friendship Group is a firm friend as demonstrated by its staunch support over the years, Tsai said. This includes resolutions passed last year highlighting the importance of Taiwan in regional security and urging the EU to fast-track bilateral investment agreement negotiations, she added. Another example, Tsai said, is the backing for Taiwan in the face of aggression from China expressed by around 20 members of the EP during a parliamentary debate last month. The MEPs also urged the EU to take concrete measures supporting Taiwan and the right of its 23 million people to determine their own future. The delegation, led by MEP and group Chairman Werner Langen of Germany, comprises MEPs Bas Belder, the Netherlands; Eduard Kukan, Slovakia; Cristian dan Preda, Romania; and former MEP Georg Jarzembowski, Germany. It is in country Feb. 17-22 on an economic and political fact-finding mission. 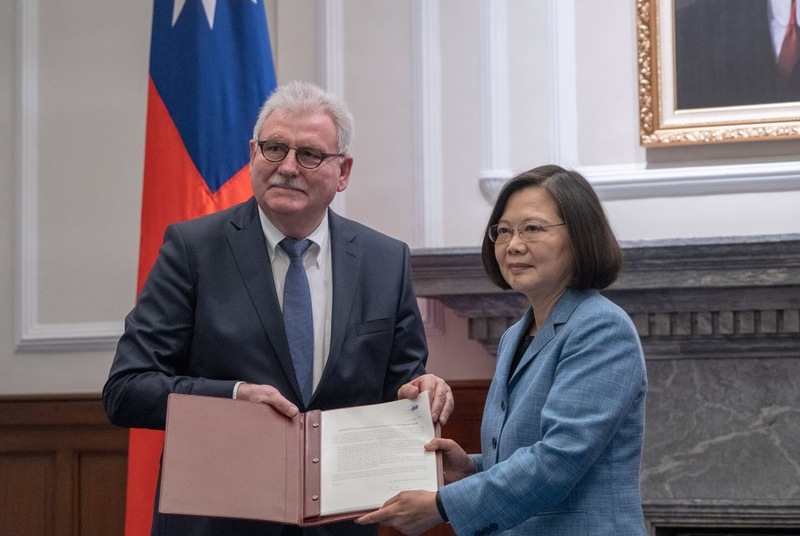 During the reception with Tsai, Langen presented the president with a statement signed by 155 MEPs backing Taiwan’s international participation and cross-strait peace and stability. Tsai, who thanked Langen on behalf of the government and people of Taiwan for the statement, said it is a resounding vote of confidence in the country and the government’s defense of freedom and democracy.